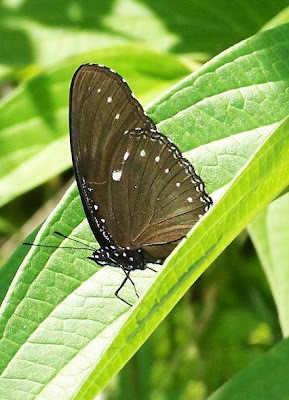 This form, with the white patch on the hindwing, is less often seen than the typical and more common form where the hindwings don't have this patch. 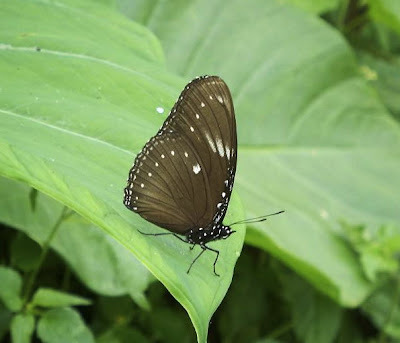 The Malayan Eggfly might pass as a mimic of a species of Euploea "Crows". 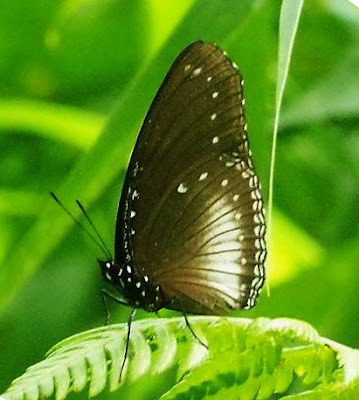 This species is subject to considerable variation and occurs in two forms in rejang land - f. anomala and f. nivas which has a diffused white post discal bands on the hindwings (pictured here). Ocassionally, examples of f. anomala occurs which has a prominent blue gloss on the forewings above. The species frequents lowland forests and is relatively common in Singapore. Sometimes, two or three butterflies are seen flying together. The butterfly appears to be territorial and individuals are seen returning to its favorite perch time and again despite being disturbed. 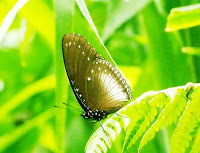 They also "chase" away other butterflies who fly within range of their territory. This species showing a unique behaviour of "guarding" their eggs. The female remains standing over their eggs even until the larvae dispersed to other leaves, and apparently may die in this position (Johnston et al., 1981). This remarkable behaviour is not recorded in others butterfly except Hypolimnas antilope (Schreiner and Nafus, 1991).